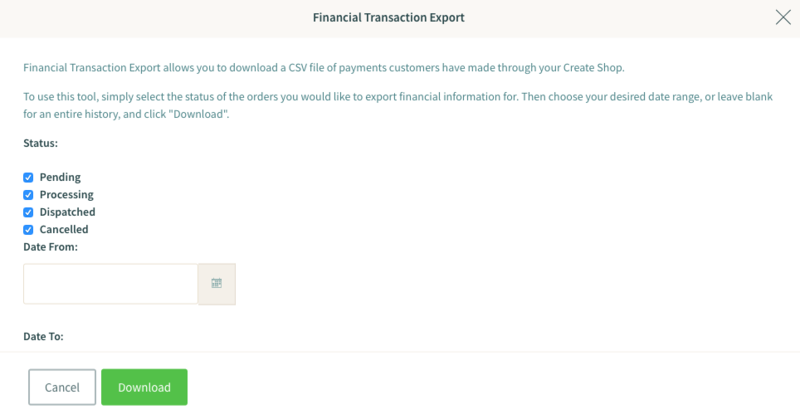 Our Financial Transaction Export tool allows you to download a CSV spreadsheet of your customers' financial transactions with you onto your computer. In this guide we will show you how to download your file and provide descriptions of the CSV fields contained in the file. Click “Shop” from the Top Menu. Click “Order Management” from the left-hand menu. Click the green spreadsheet logo at the bottom of your Order Management. This will open a screen which will enable you to customise the data which you wish to export. You can decide which types of order to include in the export by checking the order statuses you wish to see in the spreadsheet. You can also customise the date range that you wish to export from. Simply select your month from the first drop-down list, then select a day, then a year. To download the entire financial transaction history of your shop, simply ensure all of your order statuses are checked and leave your date ranges blank. Click “Download” to download the file to your computer. To read the file on your computer you will need a spreadsheet program such as Microsoft Excel, Apple’s Numbers or OpenOffice Calc. Below is a list of all the fields you can expect to see on your exported CSV file and description of what these fields mean. status - If you chose to download all of your order statuses, you will see what each order's status is, in a numeric value. These values are as following: "1" = Pending, "2" = Processing, "3" = Dispatched, "4" = Refunded, "5" = Cancelled. substatus - If you choose to download just one status, you will be able to see any substatuses of the order, in numeric value. These values are as follows: If you chose to download "pending": "1" = "Awaiting Payment". If you chose to download "Processing": "1" = "Picking", "2" = "Packaging", "3" = "Awaiting Dispatch". All other instances will show a value of “0”. Don’t forget if you have any questions regarding this tool, please feel free to email your Account Manager, who will be happy to help.